NEW YORK, NEW YORK – April 17, 2017 – GameChange Solar announced a significant development for project owners utilizing single axis trackers. The GameChange Genius Tracker™ has essentially no wasted spaces along or between the trackers enabling this wasted space to instead be utilized for wider row spacing. This results in higher kWh energy production. The GameChange Genius Tracker™ increases system owner’s leveraged return on equity (“ROE”) UP TO 20% versus leading competitors. Andrew Worden, CEO of GameChange Solar, stated: “Having run a private equity firm, and financed and built solar power plants prior to starting GameChange, I am keenly aware of the importance of return on equity for project owners. 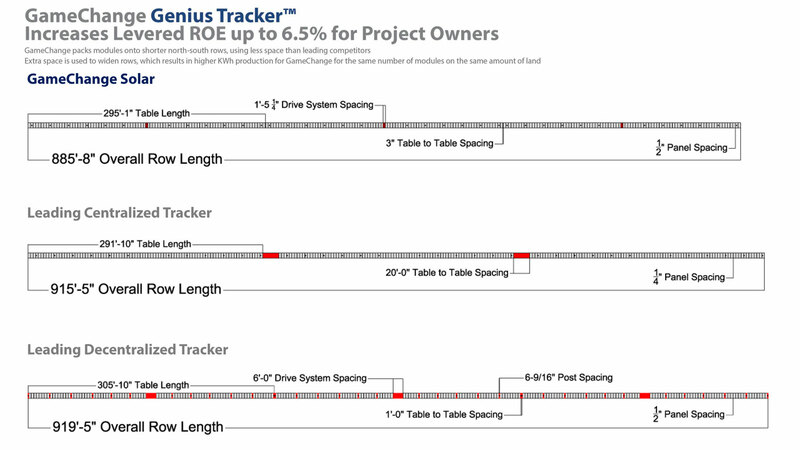 The GameChange Genius tracker is an independently driven tracker system that eliminates the breaks between trackers required for central drive systems. In addition, on the Genius Tracker, the only break is one 17 inch space above the drive posts, so panel density is 99.5%. This is significantly higher than the 97% we see with another leading vendor’s independently driven tracker system as well as with central drive systems.